At Fence Workshop™ of Atlanta, we have one of the highest levels of experience supplying farm fencing. So if You’re looking for the right company to supply farm fencing for your property in Atlanta, Georgia – You have found the right place. 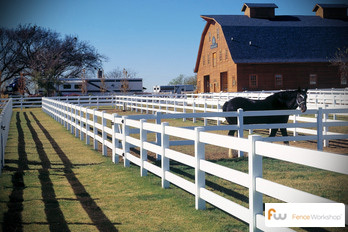 We specialize in supplying Atlanta farm fences for horses, cows, goats and other farm animals. Atlanta is full of wide open properties in its outer neighborhoods. From Marietta to Roswell, our farm fences can be seen one right after the other. Because of our experience, we understand just how curious animals can be around a new fence. Horses for example, will generally test a new fence by leaning and pawing against it. We understand what materials, procedures and precautions to take to ensure our farm fences stand the test of time and curiosity of large animals. Why choose Fence Workshop™ for farm fencing in Atlanta, Georgia? We supply all styles of farm fencing (wood & wire, post and rail, t-post & barbed wire, galvanized and black vinyl coated hog wire, no-climb horse fencing). Our farm fences come with a best in class manufacturer warranty. We Service Atlanta, GA and surrounding areas like Decatur, Dekalb, Roswell, Marietta and more. At Fence Workshop™, we work hard to make sure our customers get the fence of their dreams and are as happy as possible. We would love the opportunity to be your Atlanta fence company and show you and your neighbors what beautiful fencing is all about!